7.94 points at 17 votes (rank 95). The peace between men and barbars in Albareth did not last long. Many Elden Lords did not concurr with the peace treaty between High King Valwyn and the barbar tribes which guaranteed the barbars the authority over the area Ganston in return for their loyality towards the crown. During the absence of the king they arrested his governour Dariel in his castle. Now, that the land was robbed of its leader, chaos started to spread in the land again. 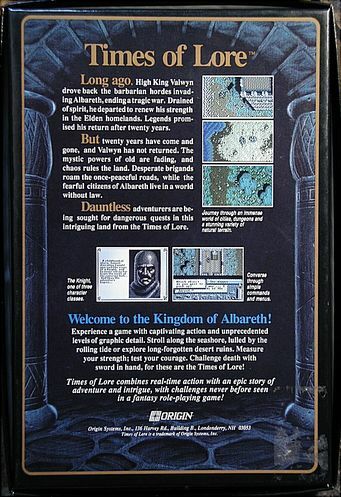 Times of Lore is an action RPG in the style of adventures that became popular on consoles, e.g. the Zelda games on the Nintendo systems. 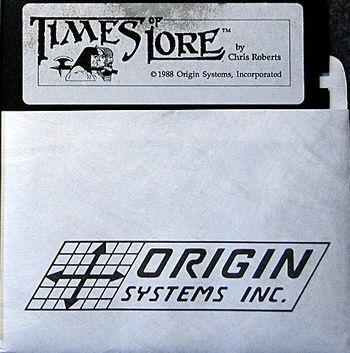 At the same time, the game borrows from the Ultima series that was also published by Origin Systems. After the introduction of the background story, you can choose between three characters that each have different fighting skills, a knight, an Amazon or a barbar. 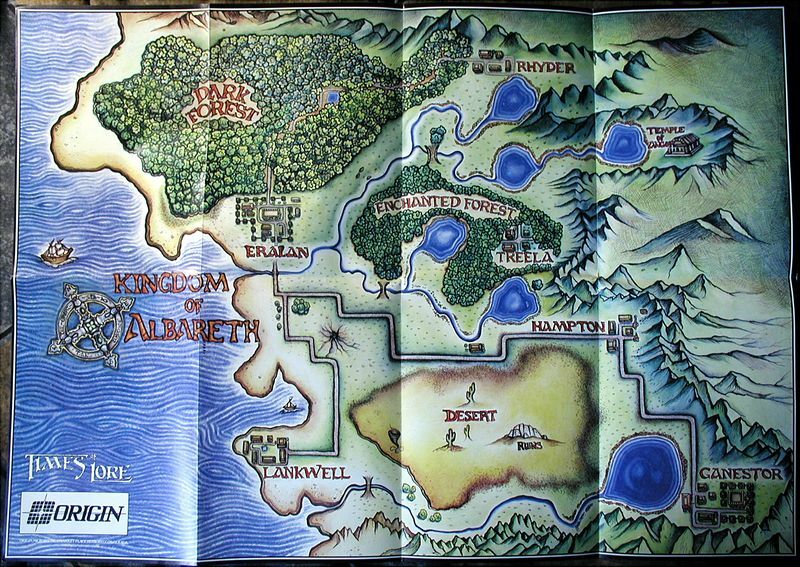 The player's task is to conjure up a spell with which king Valwyn can be freed from his involuntary ban by finding three mysterious items. For this you need to discover the world, kill monsters and fulfill small quest by talking to NPCs. This is done by choosing keywords, for which the character asks the interlocutor, from a menu. 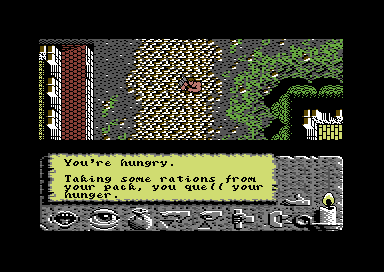 On his adventures, the character regularly needs to satisfy his hunger with provisions and can loot gold, potions and scrolls with spells from the hostile monsters. Similar to Ultima, the game is played from the birds view. The life energy is shown in the shape of a burning candle in the lower right corner. With each hit it will melt a bit. 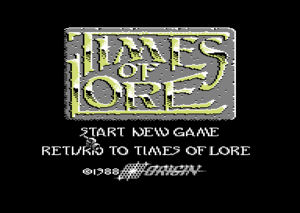 Times of Lore uses well the graphical possibilites of the C64. Landscape, buildings and characters are designed nicely. The sprites were encirceled with Hi-Res overlays. The landscape changes the colour depending on the time of day. Despite the size of the map of the game world, the game can do without loading in between. The game can be controlled almost completely by joystick, whereby you steer with the directional inputs and you use your weapon by pressing the fire button. Times of Lore cannot do fully without keyboard because with SPACE you get into the interaction menu in the lower part of the screen. Use the mouth icon to start a conversation with another person. He/she needs to be as close as possible to the own character; shouting loud in public places is not taken kindly. Enemies cannot be engrossed in conversation, they attack determinedly when you start talking to them. At certain occasions you will want to take a closer look at an item to identify it. Scrolls, potions, tools etc. can be examined closer with this. Also items that were otherwise kept invisible can be found. The sack shows a list of items that you carry at the moment and also how much money and food you still have. You can only carry a limited amount of items. When your sack is full, you need to put down items that are not helpful anymore to make some space. Use this command to pick up gold, food, treasures and other items that you will find after fights. This command allows you to drink a potion, read a spell from a scroll or use the items that you carry with you. With this you can offer an item to a person that is standing close to you. If this person has no use for this item it will presumably take it anyway due to goodwill. Potions and scrolls are partially left behind by monsters. You can only carry one item of the same type with you. So as long as you carry a blue potion you cannot loot a second one. Blue potions restore some life energy. Green potions completely restore the life energy. Red potions make you invisible. The red scroll kills all monsters. The green scrolls freezes all monsters. If an NPC says something in the course of a conversation that opens up new keywords for further enquiries, this will be accompanied by a sound. The character regularly needs to eat privisions that can be bought at the innkeeper's for 10 gold pieces. A pause in an Inn completely restores the life energy and saves the game. A night in an inn costs 10 gold pieces. Except for gold (no limit) and food (max. 9 provisions) you can own each item only once. Therefore you should not penny-pinch with the potions - only after you have used the potion of a colour you will be able to find a new one. A Red Scroll is ideal for hard quest fights if you use it at the right moment. You should not attack the NPCs if you are not in great misery, as you will partially antagonise a whole town or at worst kill a quest character without which you will not be able to solve the game. H.T.W: "If you believe, that a 'Zelda' on the C64 does not exist, you will be disabused... well, ok, there are significant differences, but the game mechanic is very similar. You can go into houses in which also the inhabitants move, workers can only be found at work a certain times, you can talk to anyone (except for enemies) and learn rumours that help you, you hear the twittering of birds when you are in the woods and the waves at a lake. The graphics are very successful and the title track is probably one of the best (and longest) that Martin Galway has written. The game can be saved and the controls are easy via the icons. This game has only one small deficit: If many enemies are displayed in a fight, this noticably slows down the game speed. 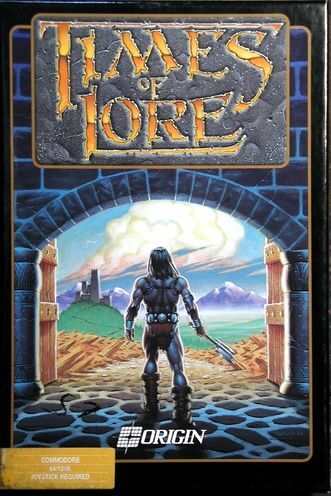 But nevertheless a brilliant arcade RPG with interesting quests. Recommendable!" TheRyk: "After a great but long intro with much awesome music, the ingame gfx and music also leave not much room to complain. Controls and gameplay must be criticized, however. It's very easy to slay a friend instead of a foe due to that fiddly joystick-keyboard-mix; this can easily ruin your day if the victim was a quest character. Moreover, if more than two sprites beside the player are in the screen, there is that terrible lag which is annoying as the action part of the game is not really tricky, anyway - once you figured out the timing, it's child's play, because you find tons of potions and food. The quest part and orientation is somewhat challenging, though, if you play without walkthrough. All in all, Times of Lore is a pretty good Action RPG with some weaknesses, well-meant 7 points including 2 points plus for the epic content and 1 point minus for disastrous controls, sprite lag and monotony in the action part." 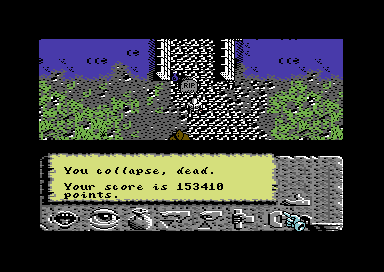 By the Commodore icon at the lower part of the screen, the game will give a highscore. The score results from the number of killed enemies. This page was last modified on 10 November 2016, at 00:46.